Learn more about this EXCITING new volleyball game, CROSSNET! Enjoy the first official four-way volleyball game. CROSSNET combines traditional four square and volleyball rules in a competitive game to 11, win by 2. Challenge your friends any place, any time, and set up within minutes in sand or grass. CROSSNET features a four-way net and is size adjustable for children's, women's, and men's outdoor volleyball heights. Points are scored by remaining in the 4 square for a volley. A point is scored when any player besides the 4 hits the ball out of bounds or misplays the ball. Only the 4 can score a point. The first player to score eleven total points wins. A player must been win by two. Where do you serve from? The 4 serves from out-of-bounds their square diagonally to the 2. From there the 2 can return the serve to any player. Can you return the serve to anyone? After the player in square 2 receives the serve they are allowed to return ball to any square. Yes, you are allowed to spike. However, spiking to return the initial serve is not allowed. The net is 210 centimeters (6 foot 9 inches) tall. The sides of each square are 200 centimeters (6 foot 6 inches) tall. What size is the ball? The official CROSSNET ball is Size 5, 10-18 panels. How much does CROSSNET weigh? 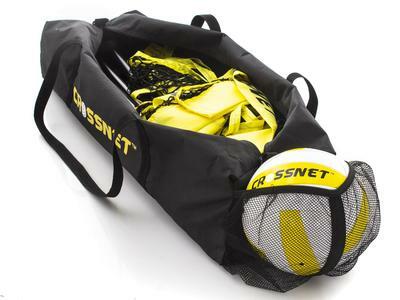 CROSSNET weighs 15lbs and can be transported in our easy to use travel duffle bag. Can only four people play? Only four people can be within CROSSNET's four squares at once. Additional players can form a line outside of the 1 square and enter once the volley is over. The player who is eliminated returns to the back of the line with the remaining 3 players rotating to the necessary positions. Can CROSSNET be played indoors? Yes, an indoor model is in the works! Stay tuned! If the ball hits the net on the serve, what happens? If the ball hits the net and lands in square 2, it is a let. Person in square 4 may redo the serve. Only one let allowed per set. If the ball hits the net and lands outside of square 2, person in square 4 is eliminated and returns to the square 1 of back of line. Can you reach over the net to hit it? After making an attack hit, you are allowed to pass your hand beyond the net, but the contact must have been made within your own playing space. How many touches do you have? You only have one touch with your hands. After that, you are allowed to make contact with the ball with any other body part other than your hands (i.e., feet and head). Setup time typically ranges from five to ten minutes. We suggest having all players involved in helping with setup to speed up time. Watch our easy to learn assembly video to set up your CROSSNET in just minutes! All CROSSNET orders are processed and shipped within 72 hours after you place your order, sometimes sooner. Email us immediately at info@crossnetgame.com and we will do our absolute best to correct the situation. Once the order is processed and shipped, the order cannot be cancelled. Please send clear photos of the damage to your item, and a detailed description, within 24 hours of delivery to info@crossnetgame.com and they will replace or repair your piece once it is received and the damage can be assessed. No worries, we can send it to you! Just contact us at whitney.getthepancake@gmail.com and we’ll resend it to you. Yes, you may cancel your order. However, canceled orders are subject to a 20% restocking fee. Yes, you will automatically receive a tracking number as soon as your order is shipped! If not, please email info@crossnetgame.com with your order # and information. Please visit crossnetgame.com for international orders. Why is my tracking # not updating? At times, the courier takes time to update their Shipping Portal but rest assured that if you have received a tracking #, the item has shipped out. Normally, courier will update the shipping portal at that time it arrives to its next destination. You will receive an email that contains tracking information once your item(s) have been shipped – please allow up to 72 hours for processing. Once shipped most domestic orders take anywhere from 3 to 5 business days to arrive depending on the efficiency of your local postal service. However, sometimes backorders do occur which can delay the process. Our goal is always to ship it out to you as soon as possible. If your order has been deemed undeliverable by the post it will be returned back to CROSSNET within 7 - 10 business days. If they can solve the problem, they will ship it back to you at no additional cost and you will receive another shipping email notification with tracking info. If they can’t figure out why it was returned to them, CROSSNET may reach out to you for address confirmation or a new address before they ship it again. Products can be returned to CROSSNET for a refund no later than 30 days after purchase. Products returned after 30 days are eligible for a store credit for the value it was purchased. Products returned and refunds are subject to a 20% restocking fee. Product must not be opened or a refund may not be issued. Your card is charged immediately after you make your purchase. For security reasons and the length of time it takes to produce each item, we cannot hold pending charges in our system and charge you when the item ships. If you have a discount code from CROSSNET, please proceed to crossnetgame.com and enter your discount code in the "Discount Code" section located on the purchase page.